← What is Redirected Aggression in Cats? This article is republished from my column on Examiner.com, with minor alterations. There is a certain behavior cats may engage in that all cat people should be aware of, because it can be a symptom of a serious condition. It’s called head pressing, and cats generally only engage in this when they’re suffering from problems causing neurological issues. Here’s how to recognize it, so that you can get your cat to the vet and diagnosed as early as possible. Head pressing is exactly what it sounds like: Pressing the head against solid objects. You’ll see your cat pressing her head against the wall, or a piece of furniture, or other things around your house, for seemingly no reason. It might even look like your cat is placing herself in “timeout;” kind of like sending a child to sit in the corner for a certain period of time. What does head pressing indicate? However, according to PetMD, head pressing can indicate any one of several problems, which range from sodium deficiencies to brain tumors or encephalitis, to a metabolic disorder, and even an infection of the nervous system. It can be a sign that your cat has rabies, although if she’s current on her vaccinations, you can be pretty sure that’s not it. 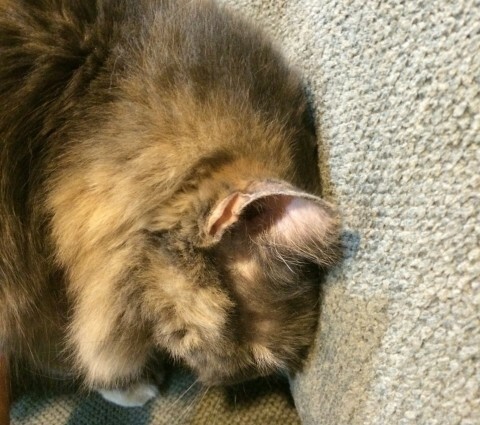 Another potential cause for head pressing is called prosencephalon disease, which is a disease in which a cat’s forebrain and thalamus are damaged. Toxic poisoning is another dangerous cause. Other symptoms may accompany the head pressing, according to Dog Heirs. Cats suffering from neurological problems might also pace or walk in circles, get stuck in corners, stare at walls, and even have seizures. Head pressing is vastly different from head butting. You shouldn’t confuse head pressing with head butting. Head butting is short-lived, and accompanied by purring, rubbing and possibly kneading, along with other affectionate behavior. A cat engaged in head pressing will stay that way for a long time, and isn’t doing it for attention. So, if you see your cat head pressing, call your vet immediately. Head pressing isn’t a condition in and of itself. Rather, it’s a symptom of several very serious conditions. Early diagnosis could be the key to saving your cat’s life. I want to know why my 2 female cats dont get along they r both jealous of me.they both want to be with me but one growls at the other if one gets around. The other .why?is there anything I can do so they can get along. One that sleep’s with me goes after the other cat if she comes in the bedroom. I hope you have some kind of ans.